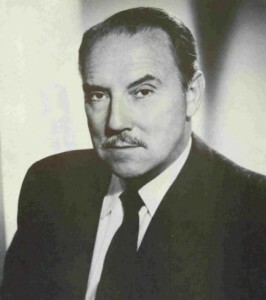 For fans of classic television, Gale Gordon earned a reputation for playing crochety authority figures. He was the second Mr. Wilson on the classic Dennis the Menace series and in his association with Lucille Ball in programs like Theodore Mooney in The Lucy Show and Harrison Carter in Here’s Lucy. Some of this began over radio with his role of Osgood Conklin in Our Miss Brooks as Rudolph Atterberry. However as memorable as these roles were (particularly Conklin), Gordon’s repertoire was more multi-faceted than that. He was the first actor to play Flash Gordon over the radio. He played Mayor La Trivia on Fibber McGee and Molly. He also was chosen to play the suave amateur detective Gregory Hood in 1946 for Petri Wine and Mutual. There were countless other appearances in a wide variety of character roles that established Gordon as equally talented as a dramatic and comedic actor on programs ranging from Tarzan to Burns and Allen, and Suspense. To be sure, his performances as Osgood Conklin were inspired and some of radio’s most hilarious performances, but when taken with the amazing depth and breadth of Gordon’s radio performances, he earn the sixth highest spot on our countdown.